Limit the size of your entourage. Keep it small. The more people who go with you the more opinions you will have. (just sayn’) Remember, you can invite more people with you to a fitting. 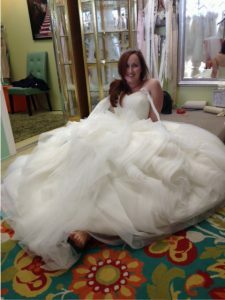 Bridal salons carry limited sizes. It would be very difficult for them to have every style in every size. More than likely, you will try on a dress that is not your size. If the dress is too large, most stores will use clamps so you can have an idea of how it would fit. If the dress is too small, they may tuck a piece of fabric in the back so you can see how it looks. In either case you may have to use your imagination to picture how it will look on you. You may not have a “say yes to the dress” moment. You know what I am talking about. When everyone tears up and that is how you know the dress is “the one” Be careful not to base your decision on an emotional response. Sometimes you just know, without the emotion. Keep an open mind. Go shopping with a style in mind and be open to trying on other styles. You may be surprised at what looks super fab on you! Don’t be shy about your budget . . . Communicate that to your entourage and sales people assisting you. Be sure to factor in alterations, shoes, jewelry, headpiece, and veil. Beware! Be careful not to let anyone talk you into trying on dresses out of your price range. It’s very difficult to compare a $5000 dress to a $2000 dress. Let your sales person know the date of your wedding. If possible, shop for your dress at least 5-8 months before your wedding to ensure you get your dress in plenty of time. Don’t let the size fool you. Your dress will be ordered by your measurements, not the size you normally wear. Wedding dresses typically run a size or two smaller than street clothes. Don’t get hung up on a size number. Don’t add the extra stress! Some brides plan on losing weight before their wedding and order their wedding gown the size they hope to be on their wedding day. Play it safe and order the size that fits you now. You can always have the dress taken in. Gear up, wedding dress shopping isn’t for the faint of heart. Be sure you eat and are hydrated before you go shopping. Wedding dress shopping can be tiring emotionally and physically. Don’t settle for a dress you sorta like. If you don’t find what you are looking for at the first store, keep shopping. Finally. Enjoy every second and make amazing memories! Happy shopping!